Your lawn certainly looks green! I love the bath bucket of grass and ajuga, a good way to keep it contained. Luckily, it does rip out fairly easily, every spring I yank it back, which actually seems to invigorate it! Are you going to dig out the hedge or let it grow back up? I have a quince hedge that has become so aggressive, but I can’t imagine trying to dig it out. It would probably take the sidewalk with it! Hi Eliza I am sorry I missed your comment. 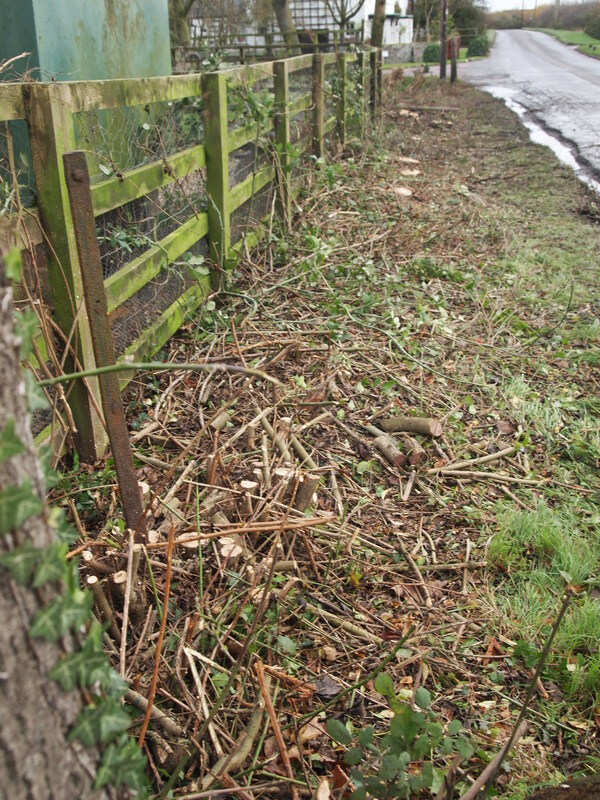 The hedge was cut down and as a large section of it was dead it was cut to the ground. The area was cleared with a chainsaw and now I have the ongoing issue of tackling the weeds as they emerge. 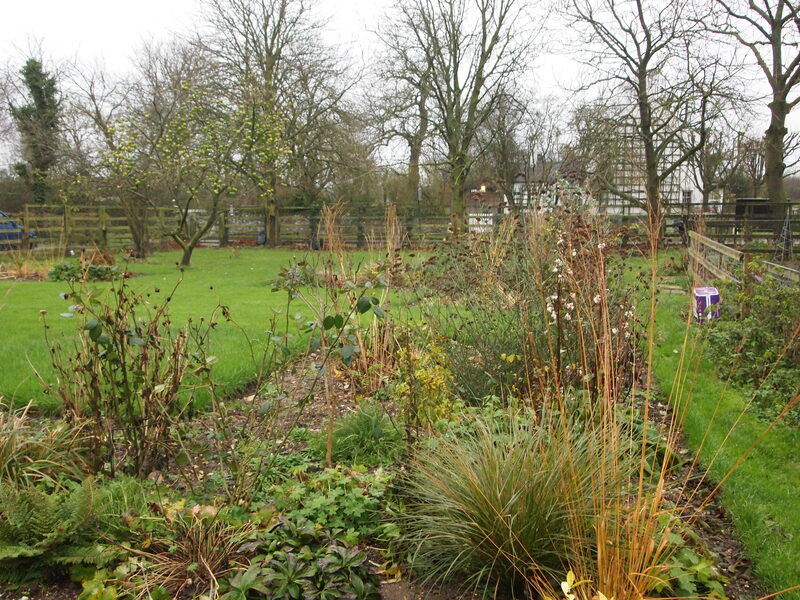 I will clear what I can and then start planting tough shrubs and native hedging. And isnt quince thorny? That will be a tough job. A good chop will probably reinvigorate it! Will you be making Scrumpy and whats replacing your hedge? Hi Julie I missed your question and have only just found it with one or two others. No Scrumpy, lots of crumbles and pies as the apple juice man had packed up for the season.The hedge has been replaced with a section of close board fencing and at the end of February a man from Norfolk is coming to weave a contiuous willow boundary. Then planting can begin. If you would like to come and watch his craft first hand drop me a note. The colour of the young Pheasant’s tail grass looks good against the brickwork. 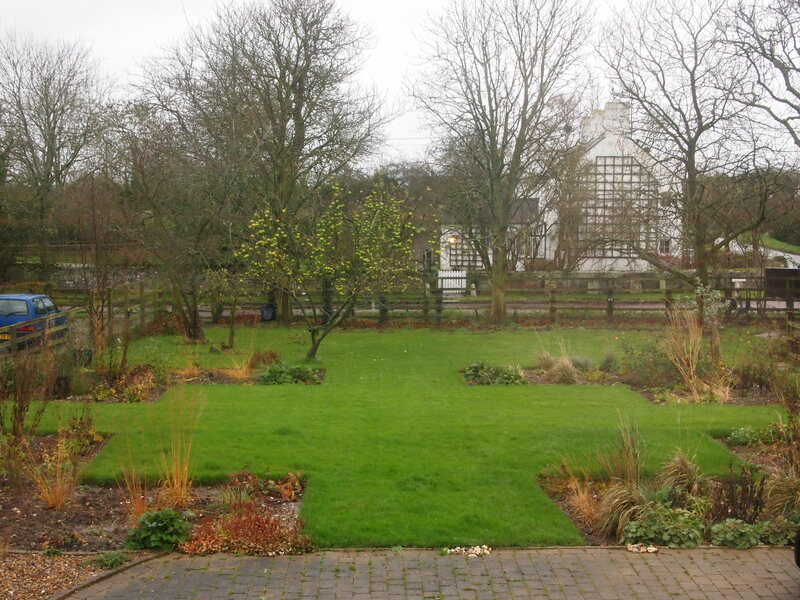 Your garden is looking very neat and tidy despite the awful weather … Inspires me to get out there and get on with it. 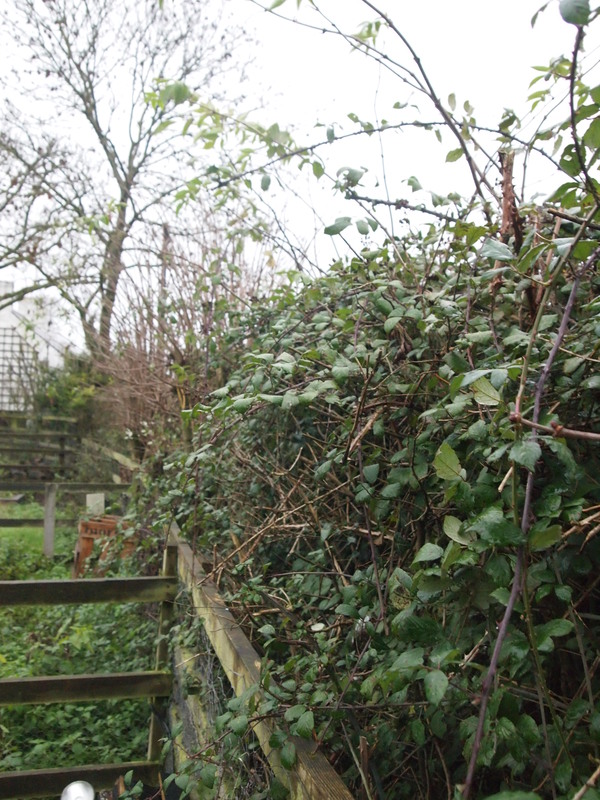 Overgrown boundary hedges can be taxing in country gardens, as you say a perfect environment for aggressive weeds – great to get them cleared back – I should be ruthless with some of ours! Bramble roots are hard to eradicate, what will you do? Looks like easy access for a mini digger and they’re good fun. Well done for dealing with this mammoth task. I must confess that I do like brambles in hedges Dorris. We deal with ours each autumn by lopping them out at the base and then pulling them back down through the hedge. They’ll grow again next year and provide flowers and fruit for the wildlife. Are you planting some bare root hedging? Hi Gillian, I love the fruit from brambles but was finding their invasion through the boundary frustrating. My plan is to select a mix of tough native shrubs to deal with the spray from the lane and the water of the ditch to offer colour and shelter for the wildlife. I think the brambles will be impossible to eradicate completely but I just need to be a bit more in control! That sound great. lets hope we have a dry spell! Gosh, what a difference it makes without the hedge! As you say, a replacement hedge is necessary in the circumstances but at least you can choose what goes in it! Will you do anything to tacle the soggy lawn or just accept that it will be like that at times? Hi Cathy the heavy clay is causing me a headache. In places it is solid. I will try opening holes in lawn and brushing in sand but I recognise that I could line the grand union canal with the stuff! I am a little concerned that some plants may not survive the Winter. Time will tell. A close board fence will replace the hedge to start with then I shall plant. Got to be able to withstand winds, standing water and spray from the lane. Any suggestions gratefully received. What a shame about the clay – even if you can lighten it in the longer run it will take time and some plants might struggle in the meantime 😦 What happens in the surrounding area may also make a difference to the drainage in your garden as my Mum has just found out to her advantage when drainage for an adjacent building plot has suddenly solved the the almost perpetual lake on her lawn. This month’s GW magazine has extracts from a current online discussion thread about heavy soils – generally advocating determination and digging… If you are going to erect a fence in the first instance would it not be worth keeping it in the longer term as well as what you plant on your side, which will give additional protection from wind and spray? Hi Cathy I have only just found this nice comment from you, I have found several from the same time and I have no idea where they have been. Anyway I saw the article you mention and read it with great interest, since December the garden has had standing water in a couple of areas. The fence is up and is certainly helping as a wind break. The next stage is a continuous woven willow fence on the more sheltered area of the garden which I can see from the house. (The fencing is not seen from the house) then it will be shrubs and native hedging a go go. I really like the pheasant tail grass in the tub, and I’ll bet it looks great with the tulips. ‘Ballerina’ is one of my favorite tulips. I underplant my container tulips with sweet alyssum but Ajuga is a good idea. I love the shape of your lawn, very elegant. Also like your planting of the fin bath, I have one that I keep changing my mind about but your planting is definitely food for thought. Helen I am not sure how but I have just found your comment from December. The fin bath you mention was purchased this year for £20 to bath the dog in. The first time I filled it with water I realised why it was in the junk shop in the first place! Anyway good drainage is good for plants, so all was not lost and in fact I am rather pleased with how it looks. Sorry to have missed your nice comment. Wow your garden has come such a long way in one season. I am looking forward to seeing what will replace the hedge you’ve removed. 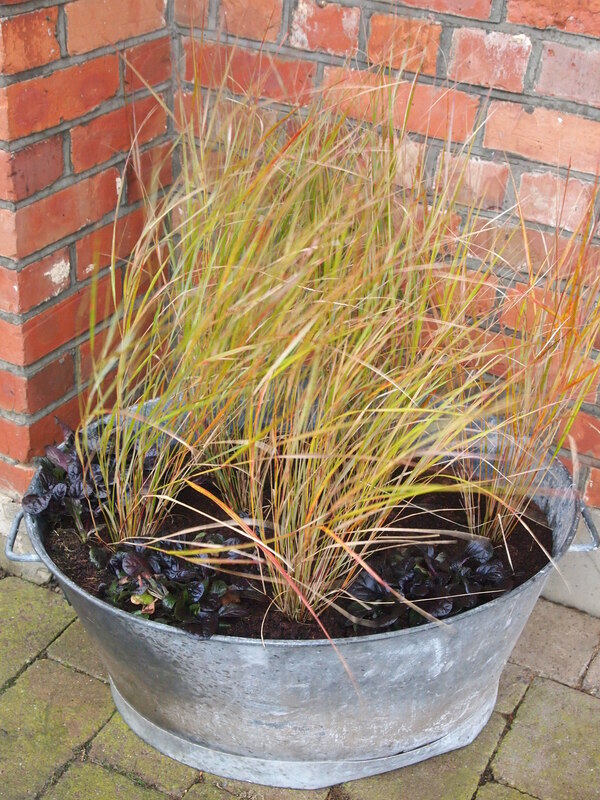 The zinc tub looks super planted up with such an unusual combination and there is the anticipation of the bulbs to come.